Sammy Walker led the Hornets' attack with a hat trick. 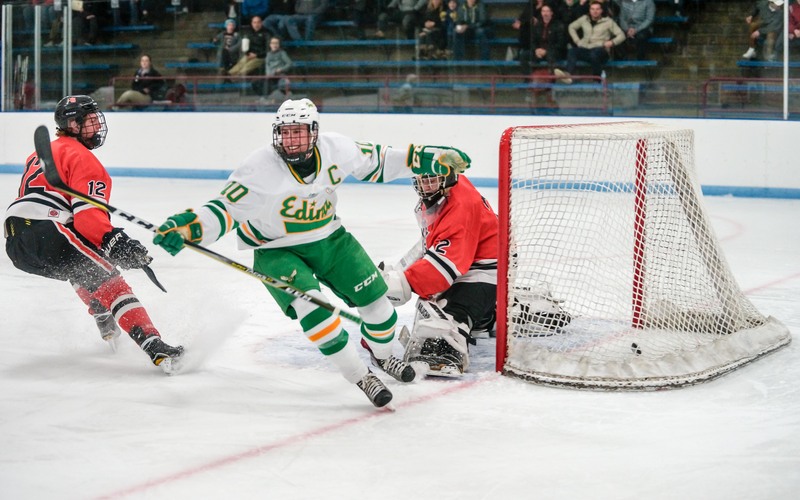 Sammy Walker recorded a hat trick to lead Edina past St. Louis Park 6-1 in Class 2A, Section 6 semifinal action Saturday night at Bloomington Ice Garden. Walker, a senior captain and Mr. Hockey finalist, opened the scoring 4:20 in the first period by converting on a breakaway, and Edina was on its way. Edina’s deep roster wore down St. Louis Park, as the Hornets used puck possession and zone time to subdue the Orioles (16-9-2). St. Louis Park struggled to keep up with Edina’s many weapons, and the Hornets (25-2) were especially proficient with their transition game, where crisp passing generated numerous scoring chances for Edina's speedy forwards. Walker took the lead and cashed in two quick scoring chances, and the Hornets, ranked No. 2 in the Class 2A coaches’ poll, dictated the shape of the game. Walker’s three goals and four point propelled the Hornets past the Orioles and into the section final for the 12th year in a row. “We set the tone early, and once we get a lead, our kids really seem to get going,” Giles said. Walker completed his hat trick midway through the second period, and assisted on the Hornets’ fifth goal later in the period to push his points total to 64 (32 goals, 32 assists) for the season. The Hornets were especially strong with their zone time, where they weaved the puck about. Edina was aided with seven power plays as well, though they converted just once. “We need to have zone time,” Giles said. “Everybody does. I think you can control the game a little bit that way, and maybe generate some scoring chances and goals in the meantime. Edina advances to face Lake Conference rival Wayzata for the section championship Wednesday at Mariucci Arena on the campus of the University of Minnesota. The Hornets, top-ranked for much of the season, have qualified for the state tournament 32 times, but has been locked out the last two years by Wayzata. One step at a time, Giles said. “We will approach it like we always do,” he said. “We have to play the way we have to play. The key to the whole thing is putting our game together on the ice, regardless of who we are playing against. Edina has a senior class of seven players, and looking past Wayzata isn’t going to happen on Walker’s watch. Walker, a senior captain and Mr. Hockey finalist, opened the scoring 4:20 in the first period by converting on a breakaway, and Edina never looked back. The Hornets, ranked No. 2 in the Class 2A coaches’ poll, used puck possession and zone time to subdue St. Louis Park (16-9-2) as the Orioles struggled to keep up with Edina’s many weapons. Walker completed the hat trick midway through the second period, and assisted on the Hornets’ fifth goal later in the period to push his points total to 64 (32 goals, 32 assists) for the season. 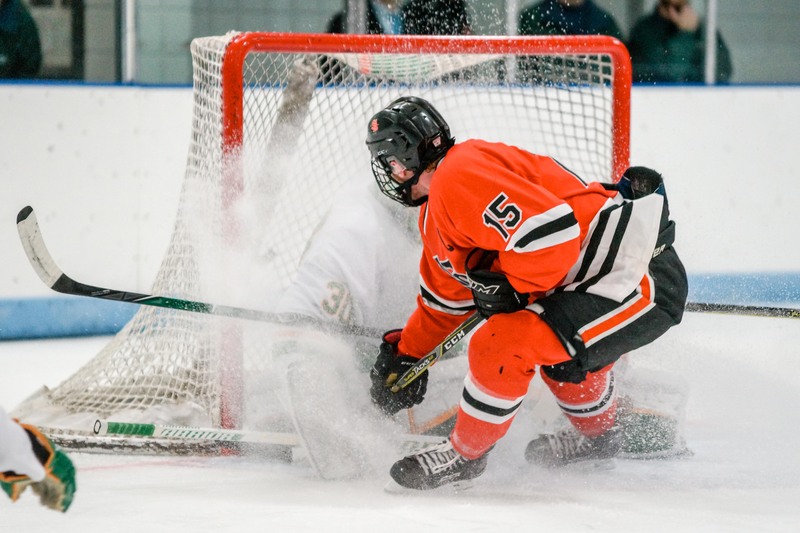 St. Louis Park’s lone goal came late in the second period when senior captain Luke Mobley buried a close range shot from the edge of the slot. In net, senior Garrett Mackay earned the win for Edina (25-2) by stopping 18 of 19 shots. His counterpart, Atticus Raasch made 35 saves for St. Louis Park.